While the materials, scale, and proportion are reminiscent of an early Texas Hill Country home, The Beck utilizes expansive window walls to add a striking light-filled openness and modern touch. The interplay of roof details, porches, and a welcoming entrance though a gate and arbor into the side courtyard give this home a unique and comfortable livability. An extended roof shelters the full glass doors leading into the dining area. The open living arrangement places the kitchen, dining, and living room adjacent to a 10’ deep front porch with two sets of triple full glass doors. Additional natural light is provided by clerestory windows flanking each side of the fireplace. The casual “family” entrance from the courtyard functions as a “drop zone” for coats and shoes, along with a conveniently located washer/dryer. 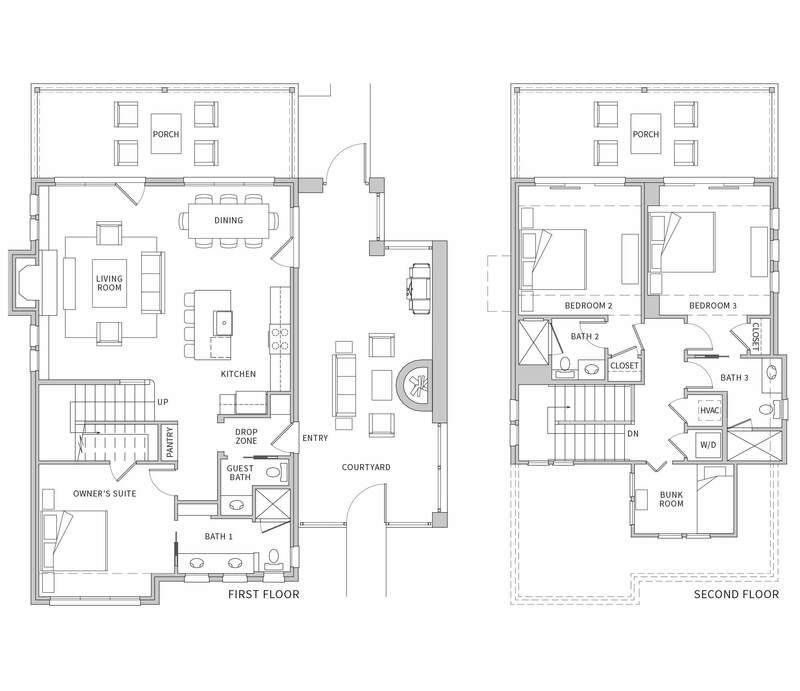 A first floor bedroom with built-in storage is adjacent to a spacious bathroom. Upstairs, two additional bedrooms each feature vaulted 11’ ceilings and 9’ sliding glass doors opening to a magnificent 10’ deep porch that’s perfect for sleeping on a cool evening. A secluded bunk room with two fold-out beds has four corner windows that offer exceptional views of the nature trail.